CM Custom Pool Designs is a family owned and operated business that takes pride in the quality of our pools and keeping our customers satisfied. Our owner, Coby Moore, has excelled in the pool industry since 1994, and his family has been involved in the pool business in the Daytona Beach area since 1971. We offer a variety of services focused on building, improving, and maintaining your pool or other water features. We also construct remarkable design elements for your home such as koi ponds and natural pools. We create aquatic beauty in Volusia and Flagler counties, Florida. We are a family owned and operated business that takes pride in the quality of our pools & keeping our customers satisfied. Services include building, improving, & maintaining your pool or feature. Founded in 2005, we are a full service pool company located in Ormond Beach, FL. We specialize in custom & luxury swimming pools. We also provide monthly pool service, repairs and renovation. Our technical staff is equipped with decades of knowledge in the swimming pool industry and are experts in their field. 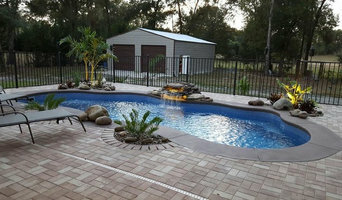 Mad River Pool Construction is one of Central Florida's most experienced and professional contractors for In Ground Fiberglass Pool, Polymer/Concrete (vinyl-lined) pools and Concrete/Gunite Pool. Mad River Pools has an extensive background in the installation of in ground spas and swim spas, as well. Founded in 1990 in Northern New Jersey, Mad River Pool Construction moved it's swimming pool installation company to the Orlando, Central Florida in June 1998. Founder and president, Michael Ramée, started his pool construction career in 1973. His many years of experience in all facets of the swimming pool industry have gained him extensive knowledge of all types of swimming pool and spa construction and renovation. Michael has consulted on 100’s of pool and spa projects across the United States and Europe (including 2 Extreme Home Makeover Television Shows). For over 20 years our expert luxury pool designers have been dedicated to creating pools tailored to the exact needs and dreams of our clients. We specialize in custom-luxury residential pool…including pools with infinity edges, rock formations, waterfalls/sheer descents, rock slides, lazy rivers, swim in place swim systems and much, much more. If you have imagined it, we have built it. At Southern Pool Designs, we have walked our customers through the entire pool design and construction process to ensure they get the custom pool and spa of their dreams. Advanced Pool Design, Inc. is a custom pool and spa construction company located in Groveland, Florida. We are a family owned business led by William "Jerry" Roland, an experienced craftsman that has been constructing backyard retreats in Central Florida for over 39 years. Our approach to the building process is unique in that Jerry will be your sole contact throughout all phases - from initial design through final inspection. He will be on site for each aspect of your build to guarantee quality control as the job progresses. Our goal is to create the perfect backyard environment that is as individual as each client! We are a custom pool builder serving the Central Florida area. With over 30 years of experience, our family owned company is the premiere choice to build your swimming pool. From water features to custom decking and equipment, we have the knowledge and experience to make your swimming pool investment a dream come true. Building a pool is often an emotional as well as financial decision. In recent years, the cost of single family homes has increased rapidly in proportion to average incomes. The result is that homeowners are moving less frequently and investing more in home improvements. A new in ground swimming pool is one investment that increases the value of a home. A swimming pool also provides a home oriented center for family fun, exercise, relaxation and entertainment. A pool need be no more expensive than a modest recreational vehicle or boat and can be enjoyed by everyone! Pools by Bradley is a local family owned and operated corporation founded in 1996. Since 1996 we have received numerous design awards and honors. Pools by Bradley was rated as one of the top 50 pool builders in the U.S. two different times in recent years and named the “Best Pool Company” in Orlando by Orlando Magazine. Our design consultants realize that each client’s pool is an expression of themselves, their life style and their home. 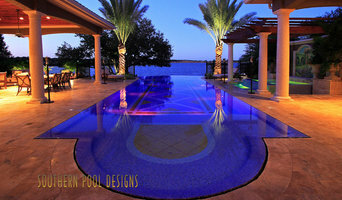 Therefore we offer expert design solutions and innovative construction techniques to create our client’s unique pool. Our superior construction provides our clients with the highest quality custom pools available in Central Florida. Each client is assigned a dedicated and reliable project manager who is responsive and easy to contact. This is how we ensure that our client’s pool building experience is worry free. Our clients are the reason for our success as we have built our business on referrals. We don’t advertise. Our advertising budgets each year go directly to local charities and have every year since we opened our doors in 1996. We invite you to come visit our showroom where we have created a wonderfully whimsical atmosphere. The environment will open your mind to limitless possibilities for your tile and rock selections as well as decking choices. We have created full equipment sets to enable you to see the equipment we will be using on your project. Our showrooms are chock full of ideas for you to consider and will put you in the right frame of mind for creating your perfect outdoor living environment. Parker Pools was started by Bobby Parker and has been building quality swimming pools in the St Augustine, Florida area since 1998. 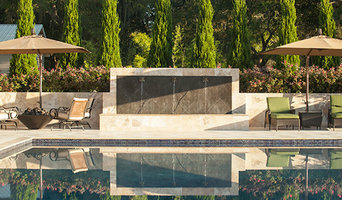 We are one of the area’s premier builders of concrete pools and spas. We specialize in custom designs that include water features to enhance your backyard experience. Contact us at Parker Pools now and let us know what we can do for you! All Seasons Pools was opened in 1979 by John and Diane Watts, with the goal of creating backyard retreats for families to enjoy and proudly show off to friends and neighbors. For 35 years, The All Seasons Pools team has worked hard to fulfill the company motto to "leave every customer with a smile," never once missing a deadline for project completion! This commitment to excellence and service has lead us to establish a solid reputation as trusted pool design and construction experts in Tampa, Orlando, Sarasota, St. Augustine, Jacksonville, The Villages and other Florida Gulf coast and Atlantic coast communities. A stable and solid company with a long, successful history- All Seasons Pools is an easy choice for your residential or commercial pool project. Premier Pools of Central Florida, Inc.
Premier Pools of Central Fl, Inc. is a swimming pool construction & design firm located in Winter Park, Florida. Premier Pools of Central Fl, has been serving the Central Florida area since 1995. East Coast Pools & Spas is your source for custom pool and spa installation as well as repair in Ormond Beach, FL, Daytona Beach, FL and surrounding areas. We provide award winning designs and professional construction with the owner and in house crews on each and every job. We are a locally owned and operated family business that takes pride in our work and reputation. We were recently named 2014 Daytona Beach News Journal Reader's Choice Award for Best Pool & Spa Builder! Owner Tom Gilbert is a native of Ormond Beach, FL and an active member of the community. He is currently a member of the Ormond Beach Chamber of Commerce,Oceanside Country Club, and Daytona Beach Quarterback Club. He is also an avid surfer, fisher, and golfer. He helps coach his son's little league team in his spare time. Mr. Gilbert has worked in the pool industry since 1997 and strives to use only state-of-the-art pool technology. He frequently takes classes to improve his knowledge of the pool industry and all safety aspects along with using green building initiatives. He and his wife, Rachael grew up in Ormond Beach and will be around for many years to come as they raise their young son J.T., age 6. If you’ve been dreaming of relaxing summer days spent poolside, it may be time to consider hiring an Ormond Beach pool builder. A professional can not only help with design and pool installation, but also aid in appropriate maintenance once it’s complete. Whether you're at the beginning stages of planning or want to revamp your existing pool, a pool company in Ormond Beach, FL will be able to get you on the right track. What exactly do Ormond Beach pool builders do? If you are planning for a new pool in Ormond Beach, FL, a swimming pool builder will analyze your outdoor space and your aesthetic wishes to determine an appropriate design for your yard, installing it once the plan is developed and approved. Once installed, some pool companies in Ormond Beach, FL can handle the necessary cleanings, water testing, renovations and equipment replacement or repairs for your pool or spa. If not, many can also suggest Ormond Beach, FL swimming pool contractors or maintenance services to help with upkeep or repairs down the road. Here are some related professionals and vendors to complement the work of swimming pool builders: Garden & Landscape Supplies, Landscape Architects & Landscape Designers, General Contractors, Landscape Contractors, Solar Energy Contractors. Before hiring a swimming pool construction company to create your new Ormond Beach, FL pool, determine how you'll be using it. Will it be for fun or for lap exercise? Will the primary users be children, adults or a mix of the two? Knowing the use can help you find Ormond Beach pool builders who shares your aesthetic. Once you find swimming pool builders in Ormond Beach, FL who share your style, research is critical. Review customer references and comments, collect at least three to four estimates to compare, meet with potential Ormond Beach pool designers and builders in person and ensure that they are Florida certified service professionals and licensed with the registrar of contractors before making any final decisions. In addition, get a sense whether they plan to complete the pool installation and be done with it, or whether they seem interested in building a long-term relationship with you. Be wary of the former: it's likely a reflection on the level of quality of the pool construction they do. Find an Ormond Beach pool contractor or designer on Houzz. Narrow your search in the Professionals section of the website to pool builders in Ormond Beach, FL. You can also look through Ormond Beach, FL photos by style to find a pool or spa you like, then contact the local pool company who designed it.